Pets Costs > How Much Does a Lorikeet Cost? How Much Does a Lorikeet Cost? The lorikeet, also referred to as the lory, will have a wavy-edge beak and a unique tongue with “brushes” to gather juices, nectar or pollen. While there is scientific differences between a lorikeet and lories, the only difference among the 55 different species, are the tail lengths, with the lories having a slightly shorter tail than the lorikeet. These active, playful and extremely friendly birds, come in a variety of colors, including the red mollucan, rainbow nape and the goldies lorikeet to name a few. The cost of a lorikeet will greatly depend on the breeder, where the breeder lives, the mutation/quality/colors, rarity and the age of the bird. Most hand-raised, weaned lorikeets, regardless of the species, will range anywhere from $250 to more than $750+. At BirdsNow, an online birds-only classified website, they had close to 40 active listings at the time of this publishing, with prices ranging from $250 to $650. Burke’s Backyard notes the prices of the bird can greatly vary from as little as $50 to more than $6,500. A well-balanced diet should consist of a high-quality nectar and/or specialized pellet diet, supplemented with fruit baby food, fortified seeds and a small amount of finely chopped fruits and vegetables. Any unconsumed fresh vegetables or fruit should be discarded after two hours. Online and at most pet stores, you can find commercial brands of both wet nectar and dry pollen lorikeet feeds. As with any captive bird, fresh water should be available at all times and should be changed at least twice a day. Always avoid feeding your bird any avocado, chocolate, sugary treats, anything high in fat, caffeinated products or fruit seeds as these food items can cause serious health conditions. A habitat, the larger the better, should be, at a minimum, 24″W x 24″D x 30″H, according to Petco. The metal bars should be spaced no more than a half inch apart and a flight habitat, while optional, is highly recommended. Inside the cage should include a variety of perches, at least six inches long, and a good choice of toys. The perches can help the bird exercise its feet and even avoid arthritis in the future. The toys can help provide daily stimulation and avoid the bird from becoming bored. When purchasing any perches or toys, always make sure they are free of lead, lead-based paints, zinc and galvanized parts as these materials can cause medical problems. On the bottom of the cage should include a metal crate, lined with a substrate, to help capture any bird droppings and keep it away from its food and water to avoid any contamination. The cage, including the toys, substrate and perches, should be replaced and cleaned at least twice a week. If the toys or perches appear to be damaged, then it’s a good idea to replace them. Most lorikeets are very outgoing in nature, but some species may be more aggressive than the next as they tend to be very territorial. As pets, they can be considered the best choice for a beginner since they are easier to handle and do not need as much human companionship when compared to other captive birds. Lorikeets are considered to be very intelligent, highly trainable and can even speak a few words. When in groups, it’s not uncommon to hear sharp shrieks and chatterings among the group. The average adult size, when mature, measures five to 12 inches long from head to the end of the tail, but this size will greatly vary depending on the exact lorikeet species. Its lifespan, when in captivity, can range from 13 to 23 years with proper care and dieting, depending on the species. Good hygiene and a clean surrounding can all increase its lifespan. 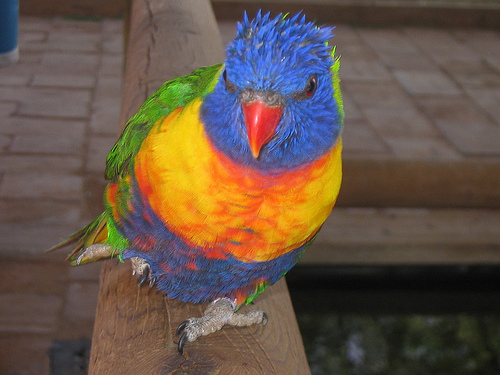 All lorikeets, regardless of the species, are herbivores. Species will range in color, from a red to green, black and blue, with many having multi-colored feathers. Chlamydiosis – Symptoms often include fluffed, feathers, a nasal discharge and/or appetite loss. Seek immediate attention if any of these symptoms occur. Psittacine beak and feather disease – Symptoms include an abnormal feather color, loss of feathers and/or an abnormal beak. Seek immediate attention if any of these symptoms occur.